One tab, one space, never more in the same place. because of the extreme nature of the subject matter of ThePointman’s subject. Still, he is very insightful, and knowing exactly what he means, and why it matters to all forms of hate and demeaning activity makes it worth reading and sharing. All of it. He makes many sound points worth considering and incorporating. He is using an older word in place of a newer one for affect, but you realize that. I’m just pointing it out for the sake of formality. He makes the point that it really boils down to fear. We must NEVER walk in fear. He talks about fighting some things, but never people, but I’ll point out that we must stand for what is right. We must stand for truth. We must stand for what we believe. The things against right, truth, and effective belief will always show themselves, and standing FOR the good, naturally combats the bad. Stand for truth. Stand for what is right. Do good to all, especially those who oppose you. Dr. Robert G. Brown writes:The tragic thing about the thoughtless use of a stereotype denier is that it reveals that you really think of people in terms of its projected meaning. In particular, even in your response you seem to equate the term “skeptic” with “denier of AGW”. via A response to Dr. Paul Bain’s use of ‘denier’ in the scientific literature | Watts Up With That?. As a Nature article, I assume it is paywalled, and I’ll not pay. As Willis says, “There has to be a better way to do science.” But how do they account for their assertions on the basins being different and the circulations being so significantly different? According to Dr. Scotese, this is the way the earth looked 14 Mya: http://www.scotese.com/miocene.htm . The only difference I can see is substantially higher sea level. I notice the caption for the global map indicates it would have been about the same as today starting about 20 Mya. I notice he stipulates “Antarctica was covered by ice and the northern continents were cooling rapidly.” I assume rapid means a half-dozen degrees C over about 15 million years. How can LaRiviere et al justify claims of such magnitude over such minute differences? It seems silly at best. Primary global circulation has always been considered key to an ice-free earth. Obviously that is impossible, even with the straights (where we now have canals) somewhat open. Of course, my understanding of premodern continental configuration and circumglobal ocean circulation can be flawed and outdated, and the base theory may be wrong, but they are asserting that the ocean was different with no apparent means whereby it might have been. Dr. Scotese suggests sea level and relative land area (and especially ice) are important factors in long-term climate change. I suppose, but the effect cannot be dominant, or we would have never gotten this cold in the first place. http://www.scotese.com/moreinfo15.htm (I suppose I should allow that something may have changed to start the cooling and increasing land and ice keep causing cooling, but then why did we stop? Why have we only gotten this cold? Our current ice age is already over 2 million years running. Why have we stalled at 285 K? Why didn’t we go down to 283 K as we did many millions of years ago? Why didn’t we go even colder? Whatever it is, it sure seems a stretch to attribute significance to CO2! 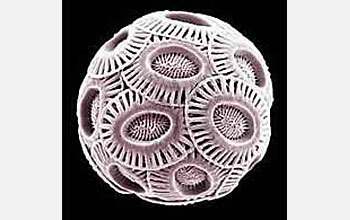 The phytoplankton Emiliania huxleyi offers clues about climate past, present and future. Until now, studies of Earth’s climate have documented a strong correlation between global climate and atmospheric carbon dioxide; that is, during warm periods, high concentrations of CO2 persist, while colder times correspond to relatively low levels. However, in this week’s issue of the journal Nature, paleoclimate researchers reveal that about 12-5 million years ago climate was decoupled from atmospheric carbon dioxide concentrations. New evidence of this comes from deep-sea sediment cores dated to the late Miocene period of Earth’s history. While the key must be improvements in sanitation, the obvious “good” in this article is vaccines. Please support vaccination programs in all ways. Avail yourself and your children to vaccines, and support efforts to vaccinate all over the world. The incidence of rotavirus throughout Bangladesh, Bhutan, India, Nepal, Pakistan, and Sri Lanka was higher during the coldest, driest months of the year — from December to March–the study indicated. Increases in temperature and precipitation in other parts of the year resulted in lower levels of the virus. Patterns were consistent across the geographical regions, though the fluctuations varied in intensity.